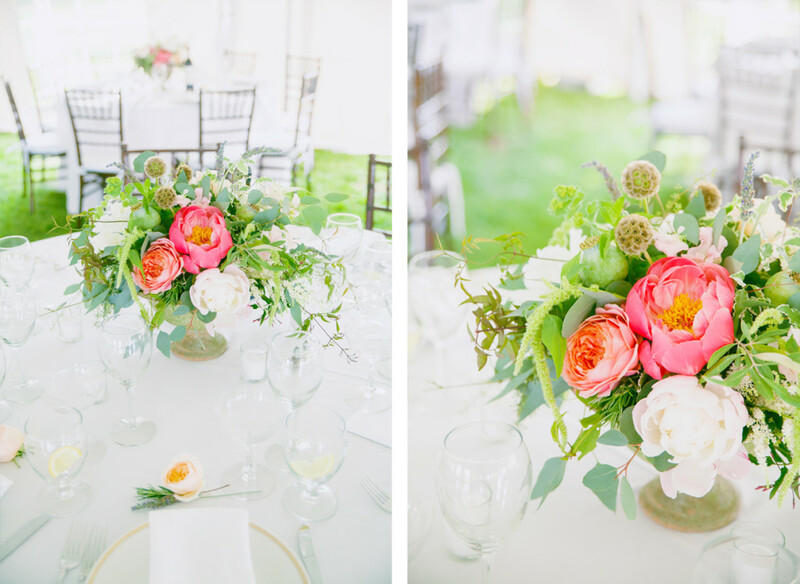 This Saturday we had the pleasure of working on not one, but two beautiful weddings. Both were relaxed, but elegant, garden inspired design incorporating the beautiful blooms of early summer. 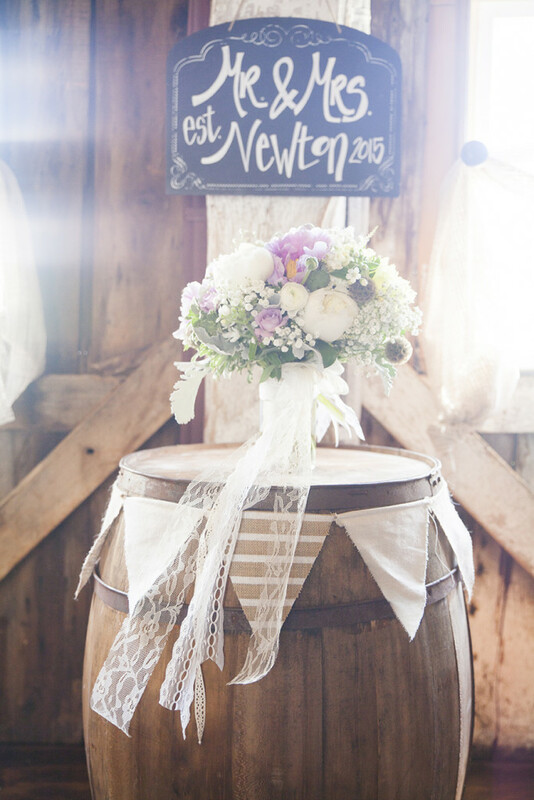 The first wedding of the day was a small intimate event, taking place at the Adair Inn, Bethlehem. 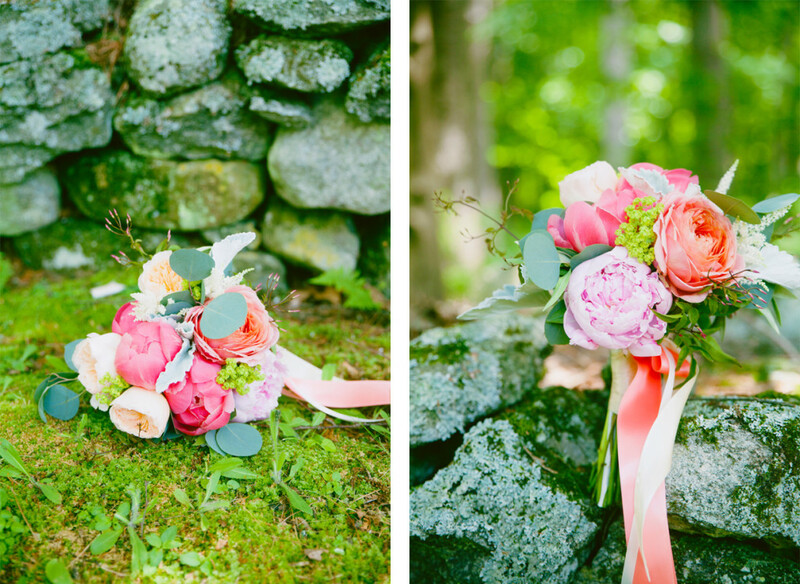 We had a chance to photograph the bride, and bridesmaid’s bouquets against the beautiful mossy stone walls that lead to the venue. 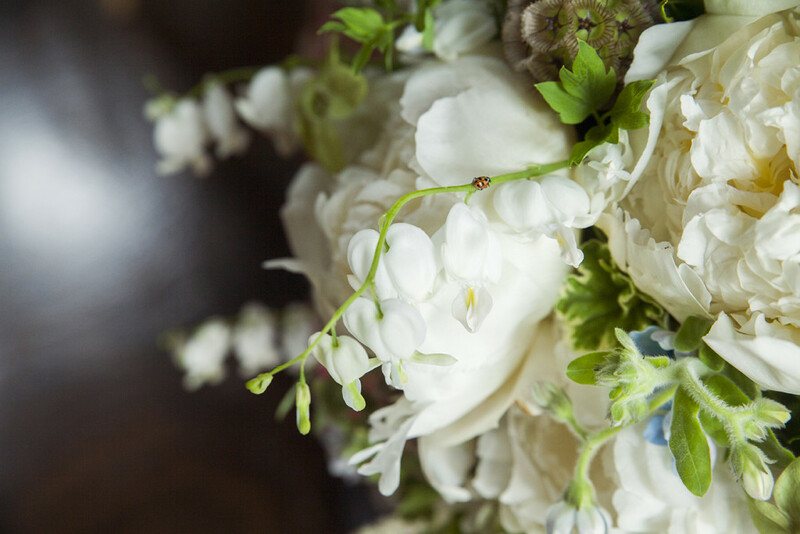 Wisps of jasmine vine made it’s debut for the summer in both the bride’s and bridesmaid’s bouquet. 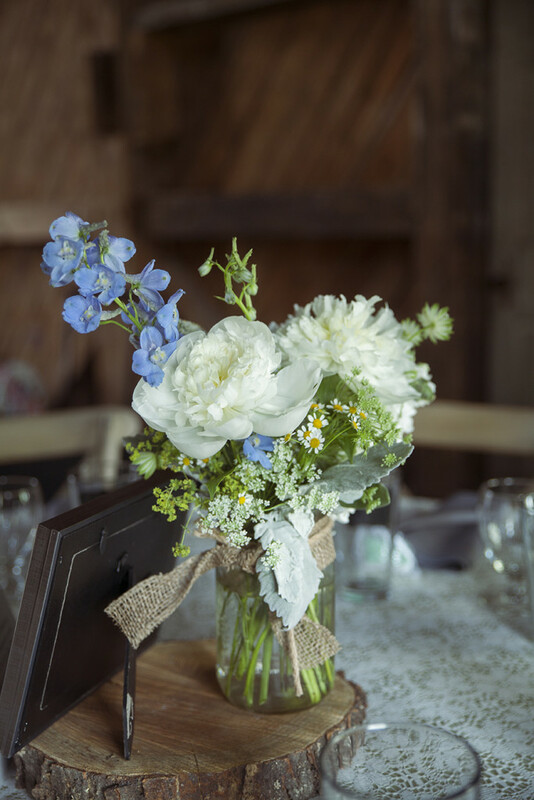 For the centerpieces we designed ten mini jars from Crate & Barrel, that created a floral line down the long dining table. 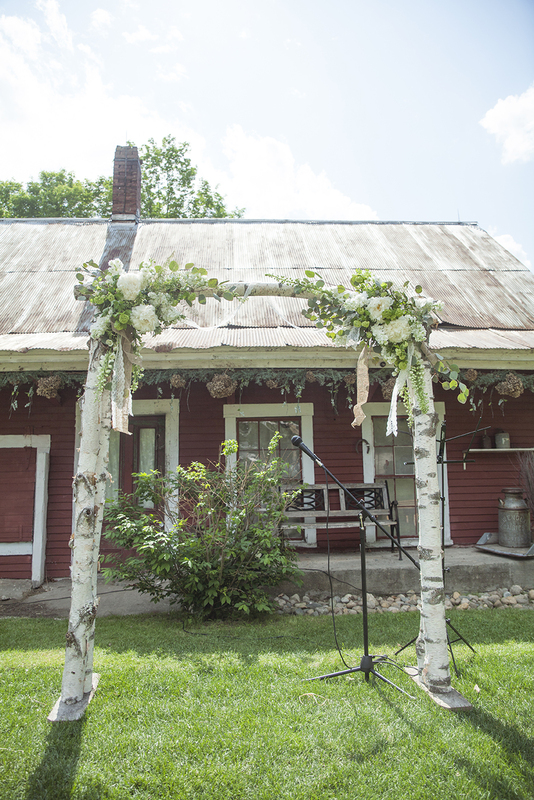 The second wedding was located at Peckett’s on Sugar Hill on the beautiful historic and scenic road Lover’s Lane, Sugar Hill. This is site of the first school in America, and the former Peckett House Hotel. This venue was both historical and beautiful. 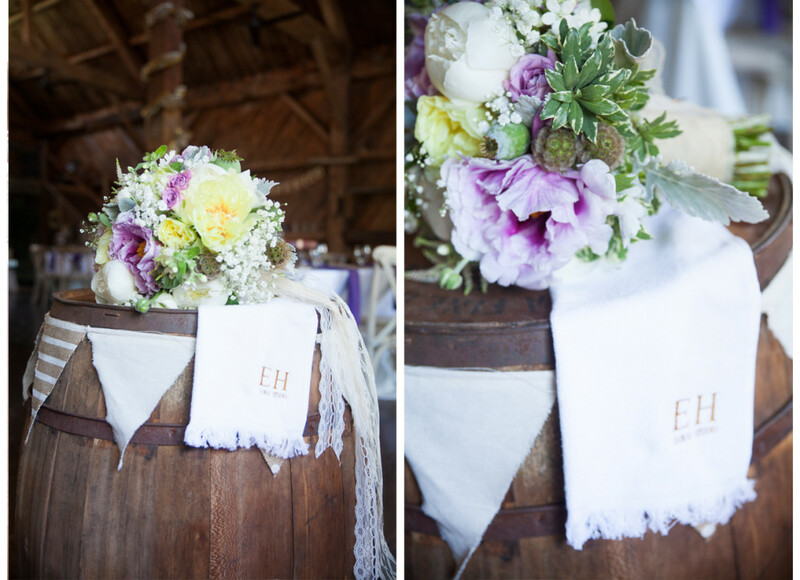 We were fortunate enough to have designed the flowers for the bride’s cousin last year at the same amazing site. It is always nice to work for the same family again. 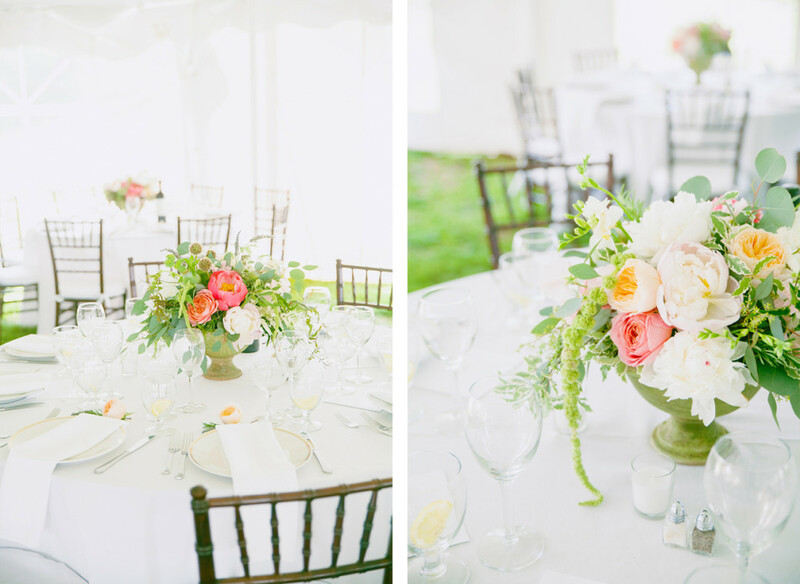 The centerpieces containers we used are from Campo de’ Fiori, stunning clay pots that slowly grow moss over time. 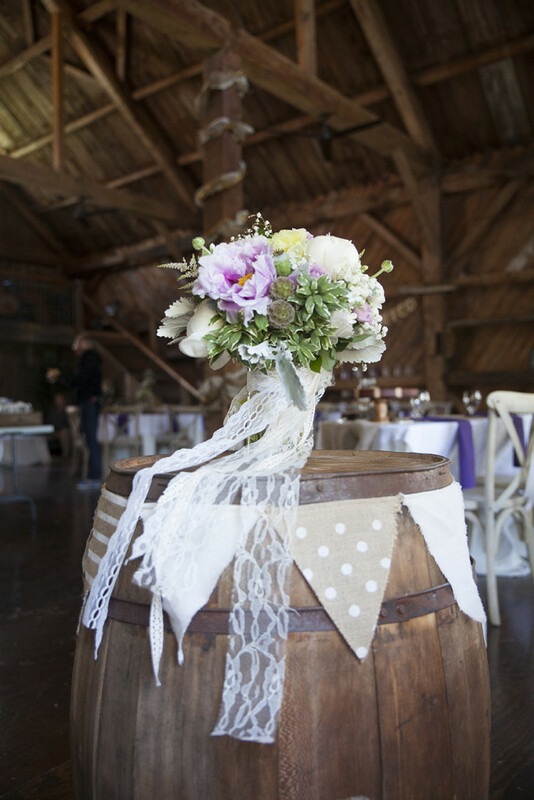 These are part of our rental collection and are a gorgeous for a garden inspired wedding or event. 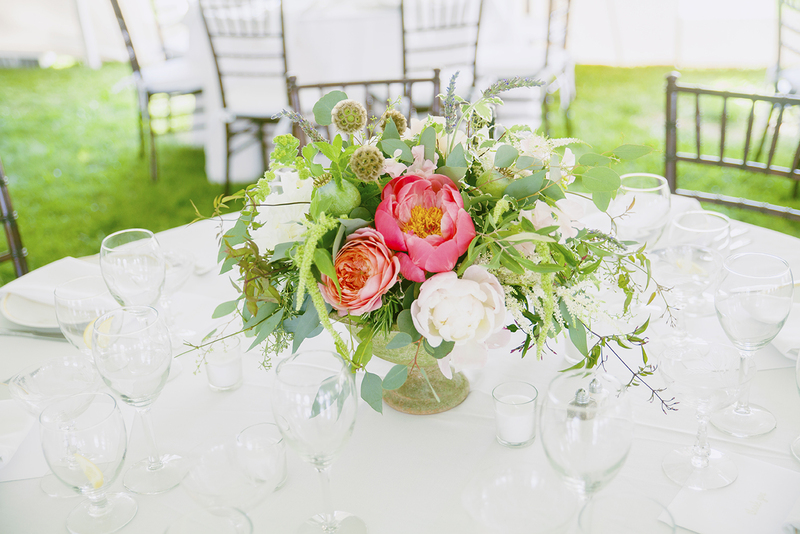 The arrangements featured beautiful trailing amaranths and jasmine vine, “Coral Charm” peonies, “Juliet” and “Romantic Antique” garden roses, mint, rosemary, and eucalyptus making it feel wild but still elegant and so fragrant! 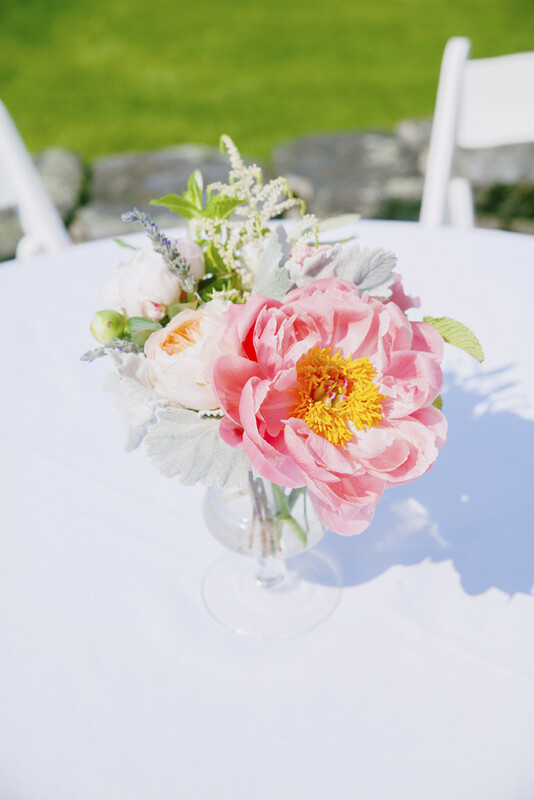 We hated saying “goodbye” to these beautiful coral peonies and garden roses, we had become quite attached to them in the studio over the last few days. 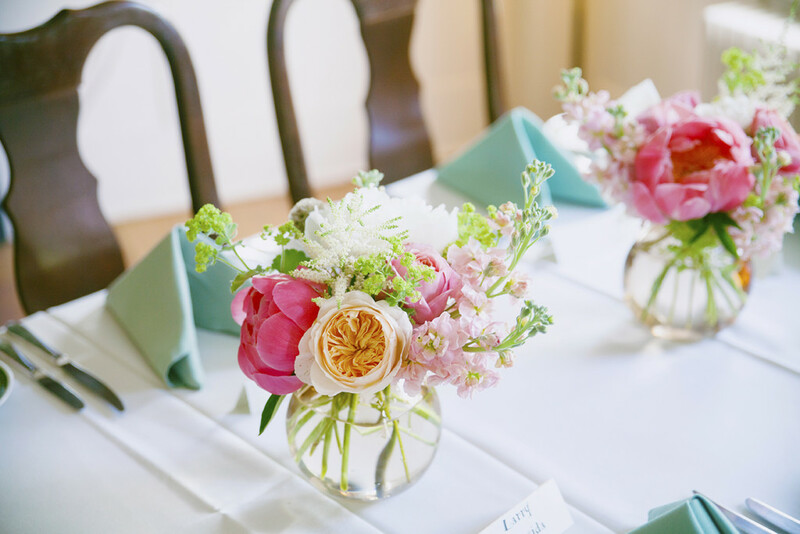 The cocktail arrangements for the tables held many herbs — rosemary, mint, and lavender to play with the mint julep cocktails they would be served later that evening as a signature cocktail. Beautiful cast iron urns provided by the bride’s family (descendants of the hotels original owners) to be used at both the ceremony and the cocktail hour. 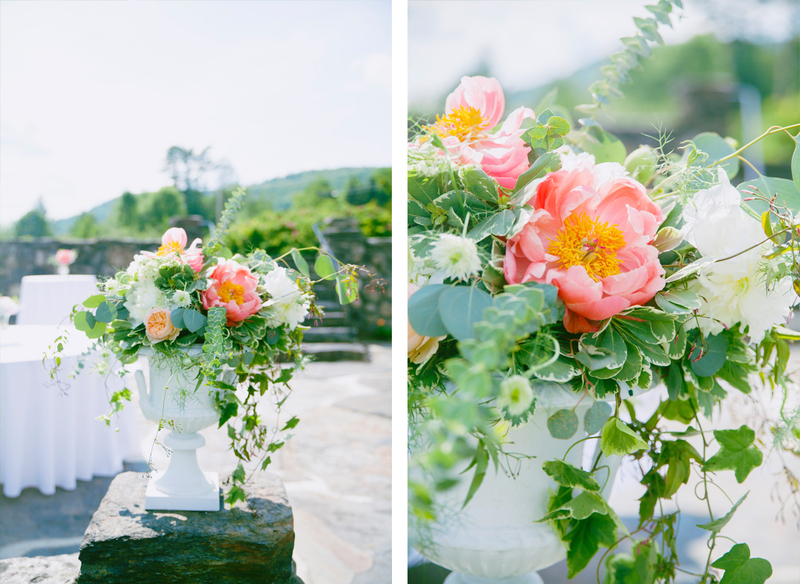 The urns actually belonged to the hotel that one stood on this amazing property, being repurposed. 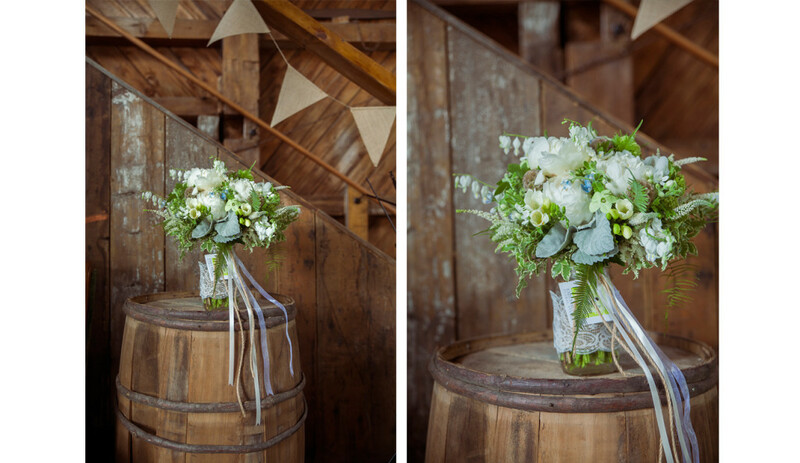 They were filled with beautiful cascading greens overflowing over the side. 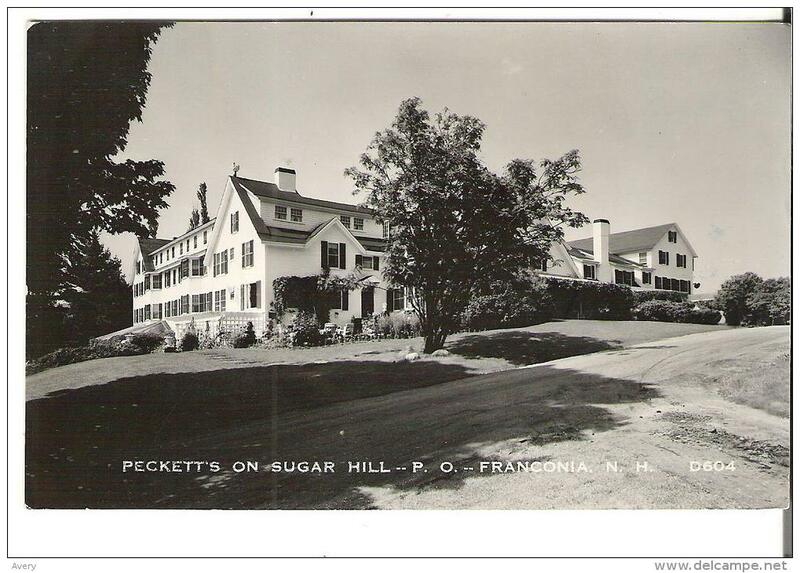 If you look closely you can see two of the urns used for the ceremony flowers in the lower left of this vintage postcard of the original hotel. 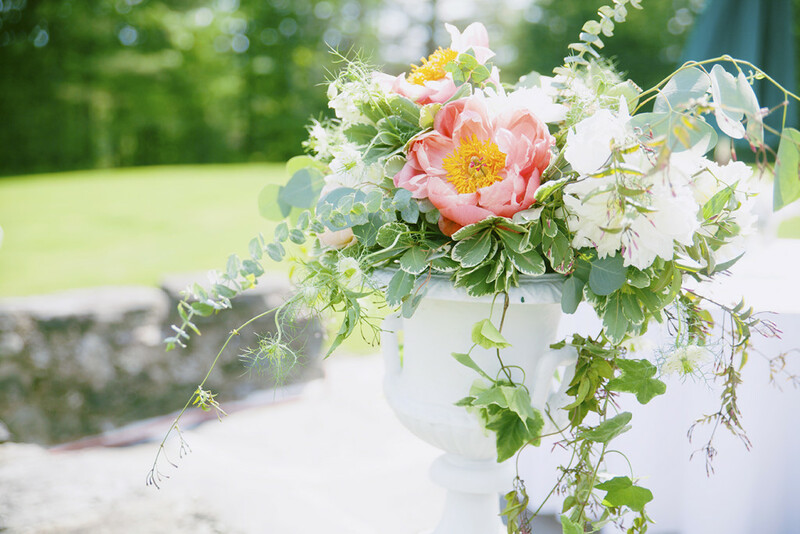 The urns were placed on the stone wall that used to be the steps leading up to the hotel, this was where the cocktail hours was held. 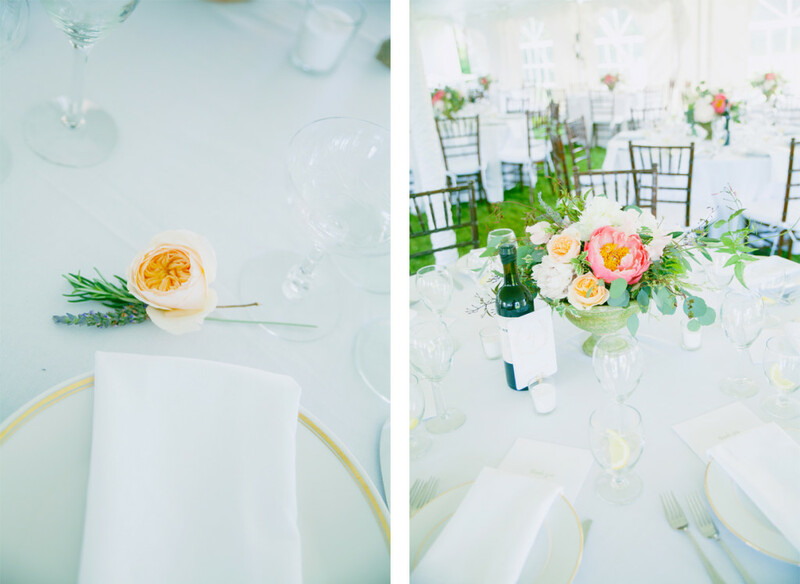 We left a small sprig of rosemary and lavender and a single “Juliet” garden rose infront of both the groom and bride’s dinner plates (also the original plates from the original hotel). 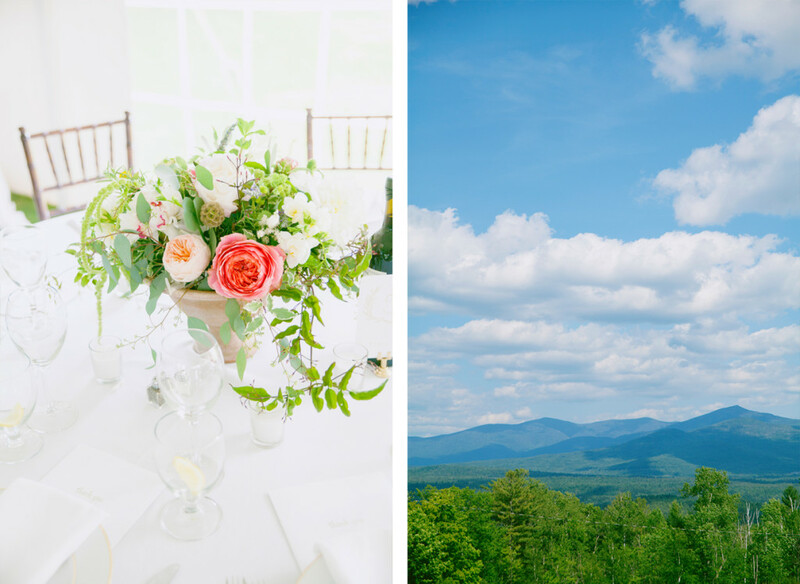 It was a pleasure designing and creating for our clients and their families, and being guests of two wonderful local venues in the beautiful White Mountains where we live! 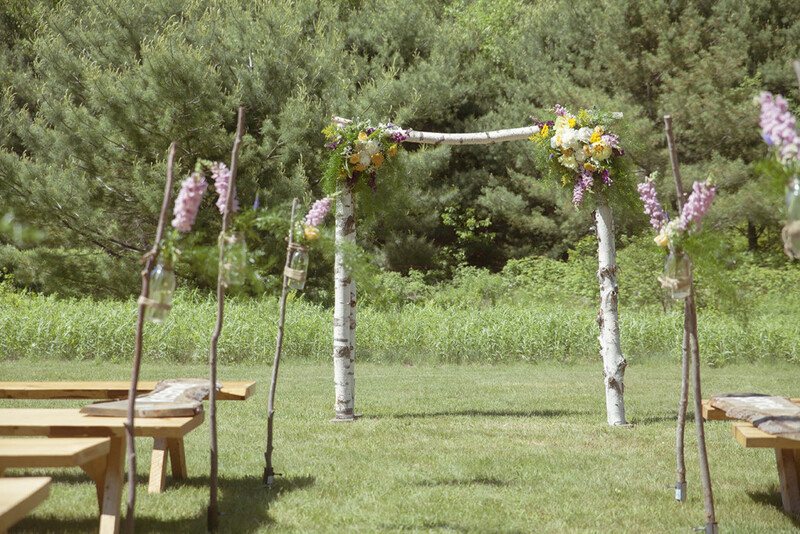 Next weekend it’s two more beautiful New England weddings, one on Saturday at Sugar Bush Resort, in Warren, Vermont, and one on Sunday at the Profile Club in Franconia, New Hampshire. 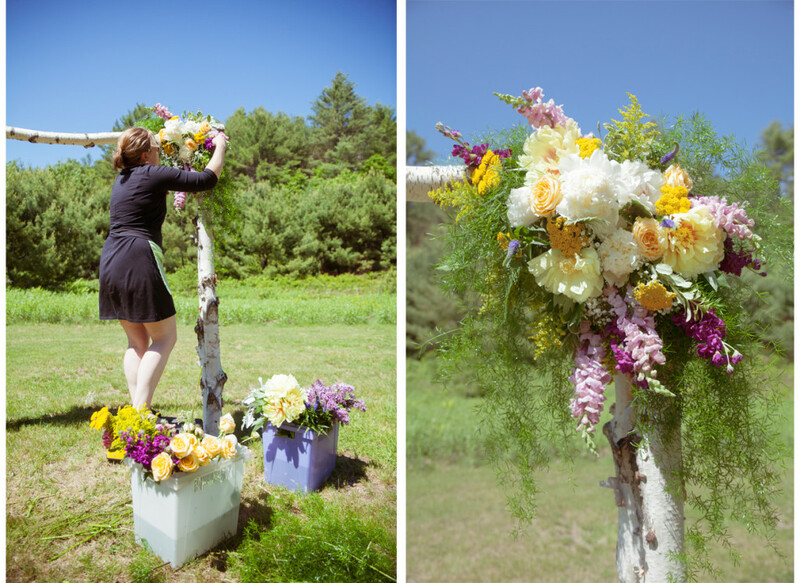 Sometimes we work with clients we never get to meet in person until we deliver the flowers. This was one of those special occasions. 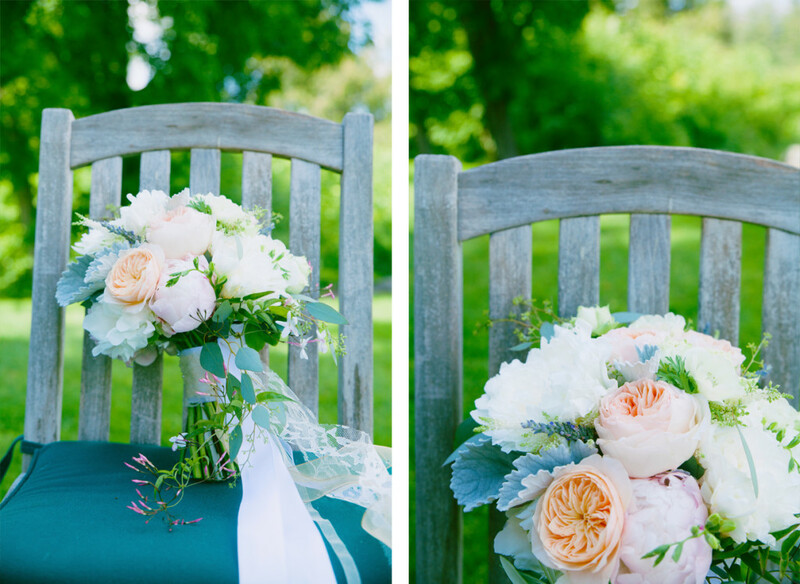 It was touching to see the beautiful bride burst into tears when we delivered her delicate baby’s breath and peony bouquet. 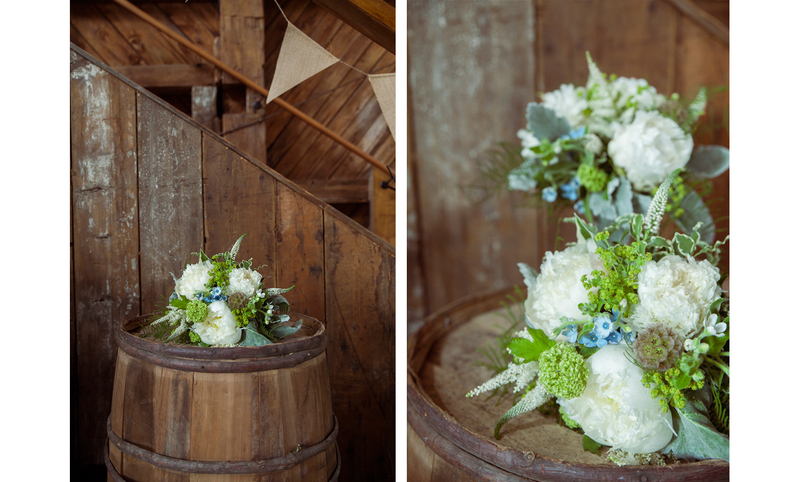 We don’t usually work with baby’s breath, so it was a fun and challenge for us. 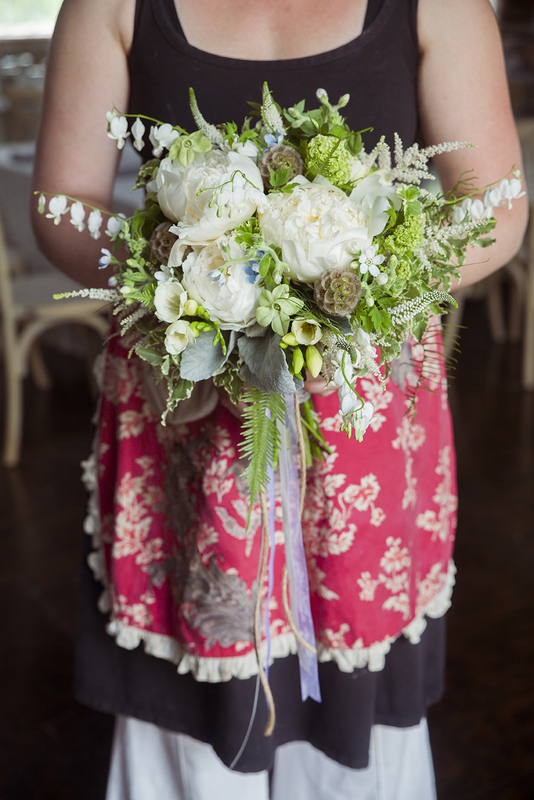 We incorporated lacy textures of Queen Ann’s lace which adds to the delicate look of baby’s breath. 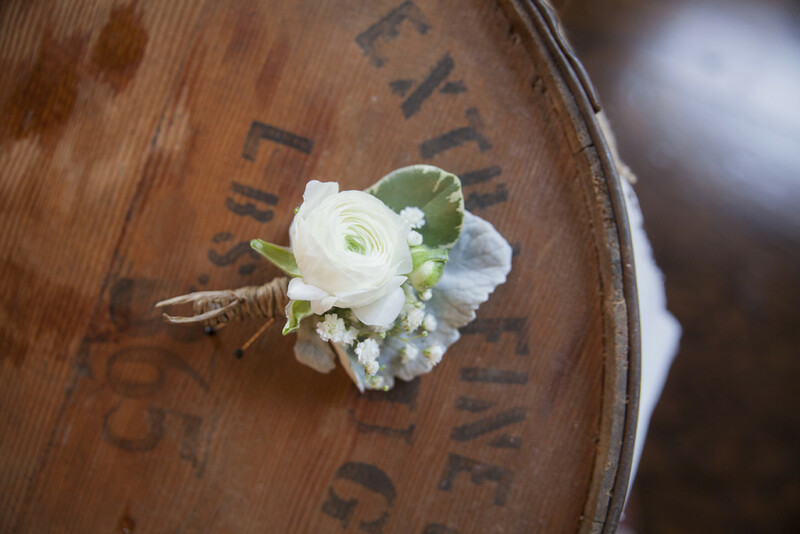 The groom’s boutonnière was wrapped in a single piece of twine, to make the groom’s boutonnière to give this wedding a masculine touch. 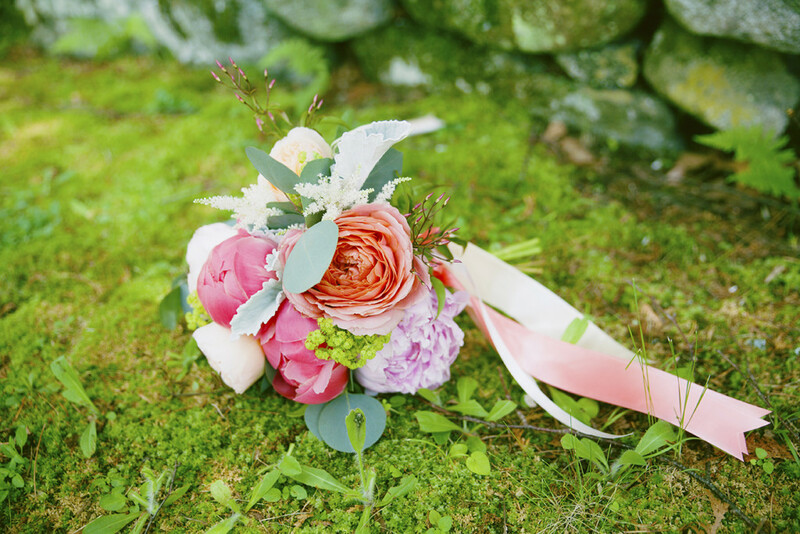 We are so glad that it is peony season. 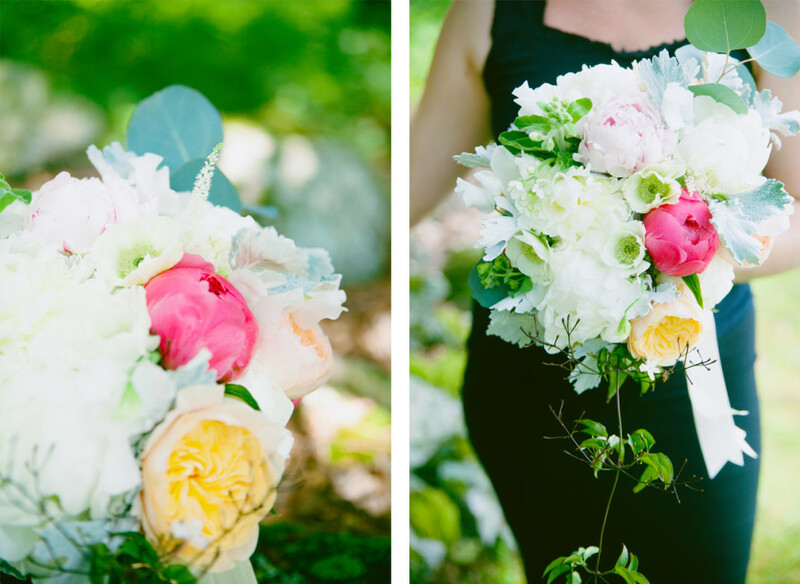 The beautiful shade of these pale buttery peonies added a soft warmth to the bouquets. 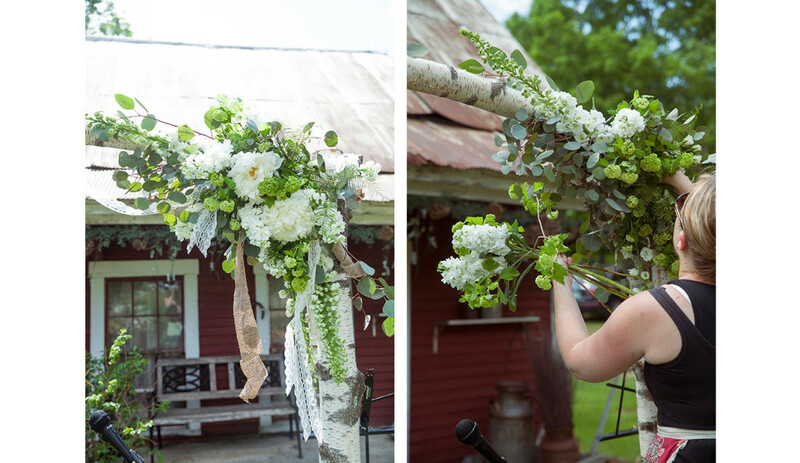 The bride requested we make a small bouquet for her to throw, so she could hold onto her’s. 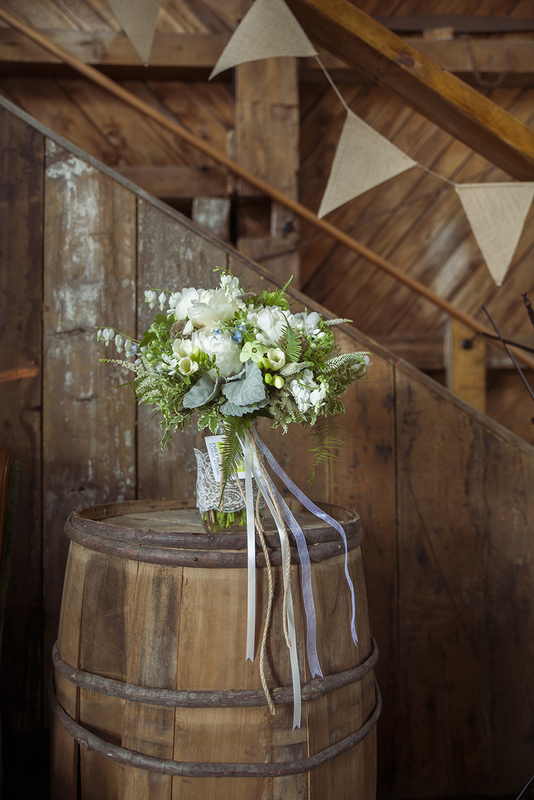 We made a delicate little toss bouquet out of baby’s breathe and yarrow. 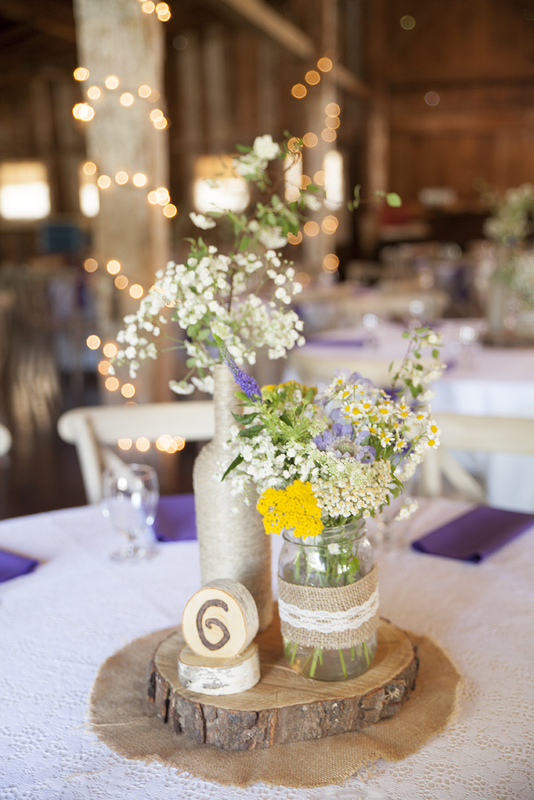 These sweet little centerpieces had a hand-pciekd feel from the sweet chamomile and the beautiful wild spirea. 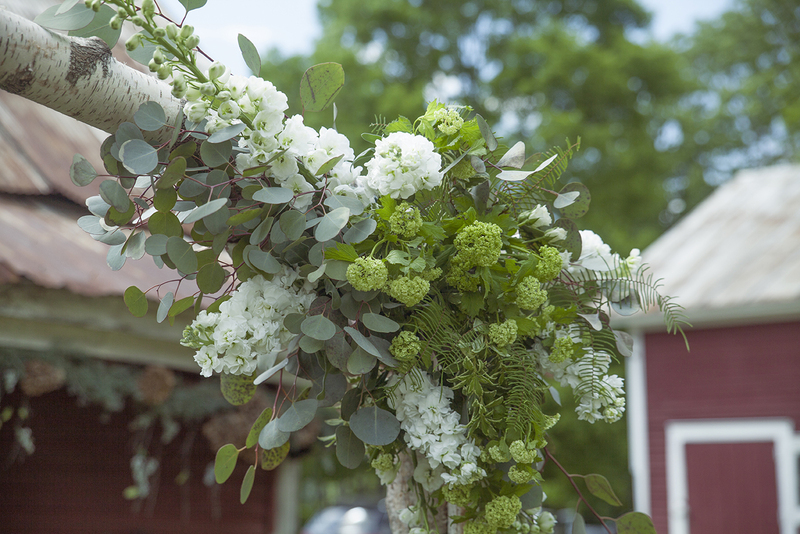 We used some beautiful asparagus vine in the arbor to give the arrangement more movement and life. 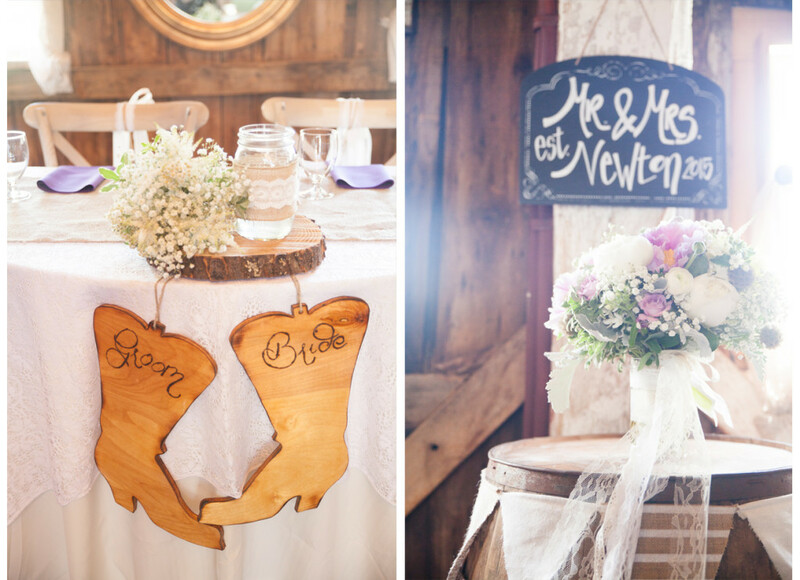 It is always a joy working with clients at the Bishop Farm and having a part in creating the perfect day!